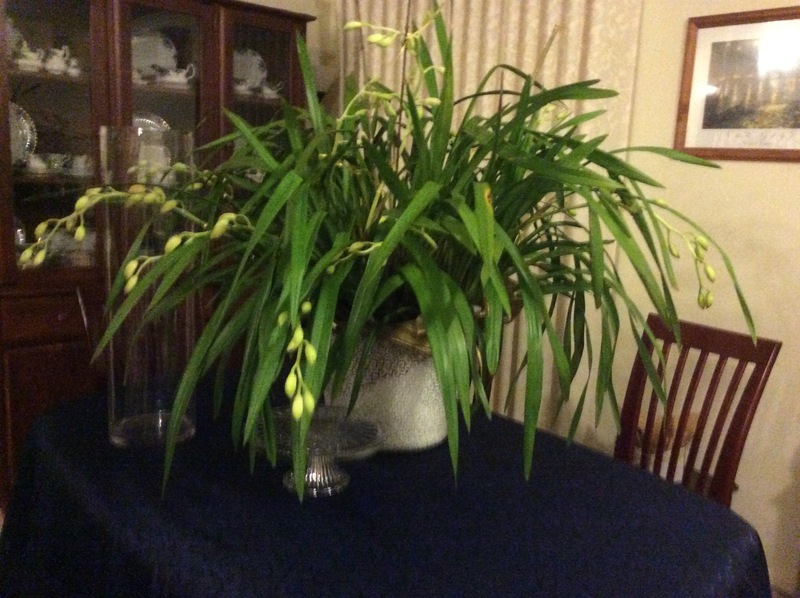 This year my orchid plants are doing so well. 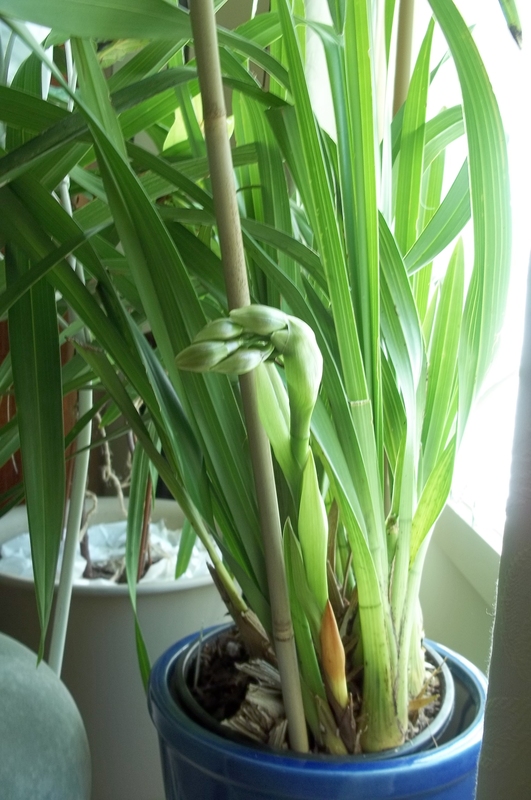 It is my lucky year, one of my cymbidium orchids has sixteen stems,and they are looking healthy and beautiful. 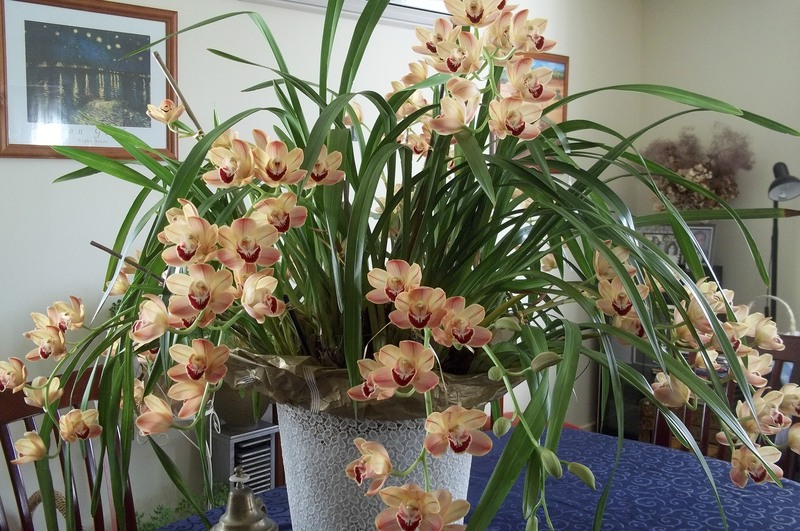 Cymbidium Orchid with sixteen flowers. 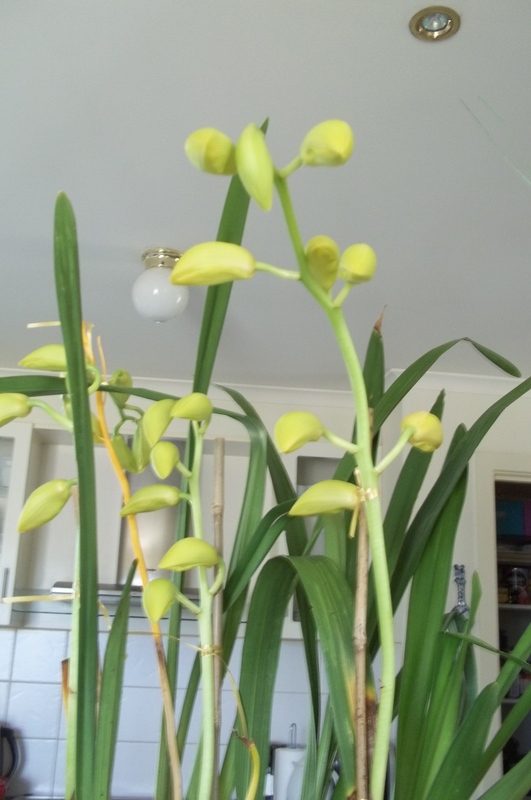 More cymbidium orchids to flower, they are six plants sitting inside the house. The colour has changed since last year. I is soft red now. The red colour is pretty, however the colour has changed since last year, from deep red to be a softer red. I could not explain why. 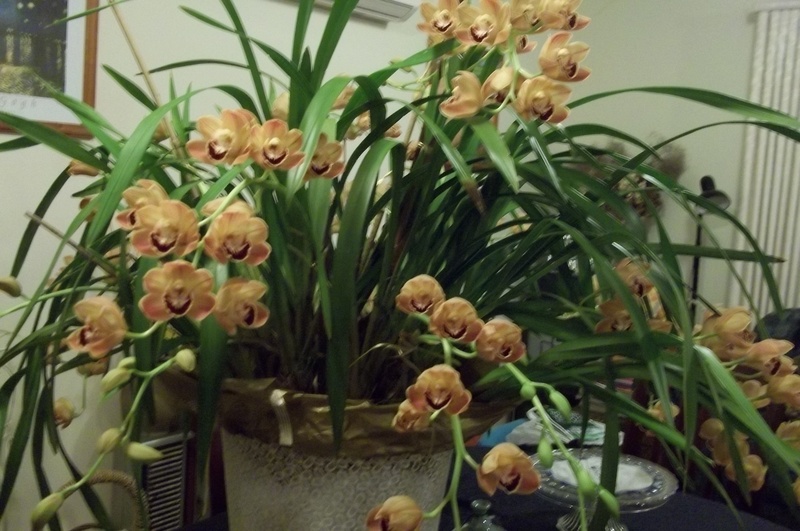 More Orchids, the cascading orchid (Sarah Jean) has seven spikes, and the upright one has only one spike. It is good seeing the buds growing bigger everyday. 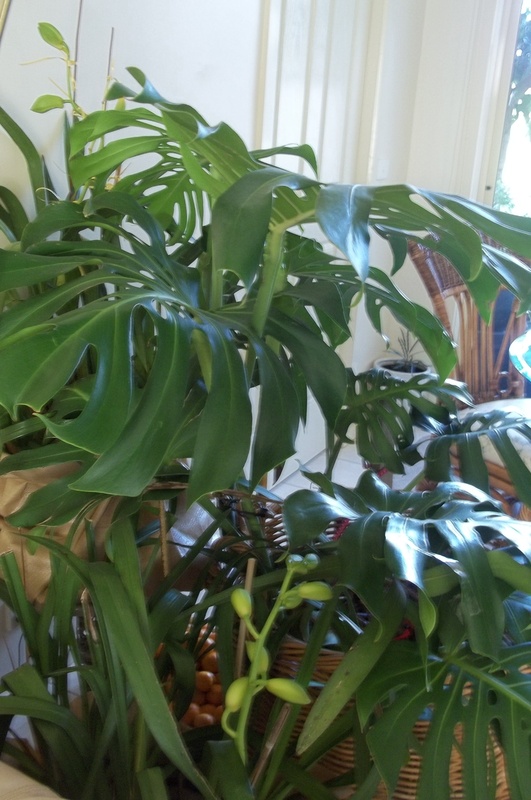 In Between Indoor Plant. 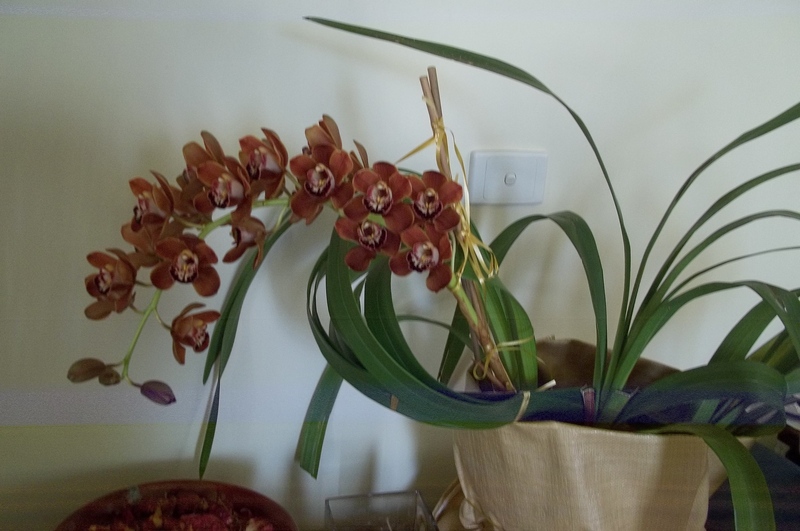 I am hoping that the orchids are happy enough to be there, maybe there is not enough air circulation, but wait and see. 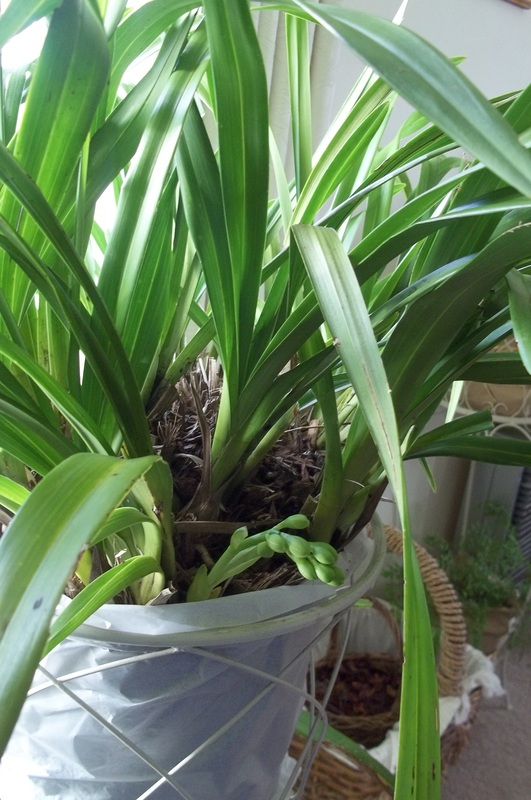 Two budding cymbidium sit together closely with the indoor plant- Monstera Deliciousa. 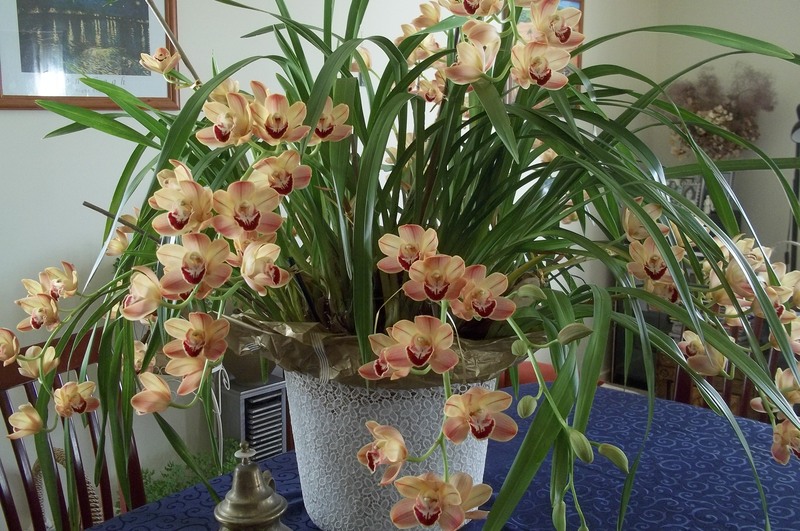 Cymbidium Orchid Flowers In Tall Vases. 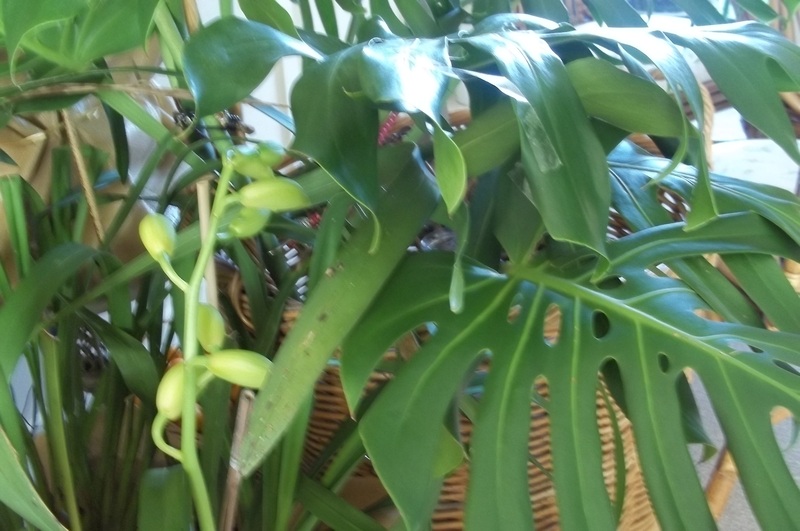 There are seven orchid plants inside the house which are in flower, they are not many considering I have forty plants, but a plant produces sixteen stems/ flowers. It is a record for me, amazing. I am blessed. I am glad I could share these pictures with you. Enjoy! 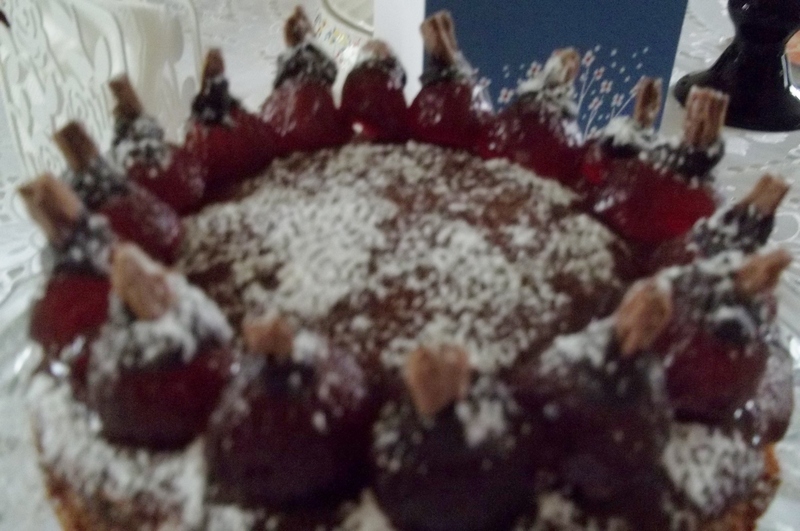 It is all about my cooking for the past months and also to catch up what is going on in my garden. 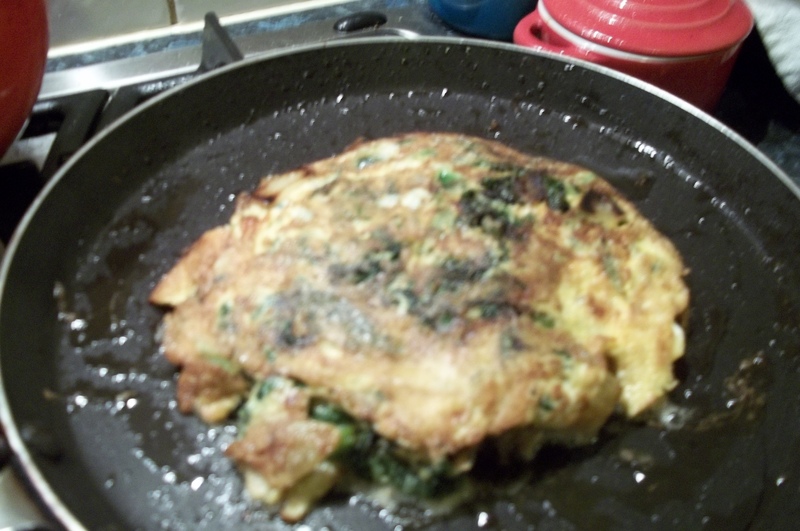 They were beautiful cooking since March up to June. Celebration of our first arrival in Australia is in March. 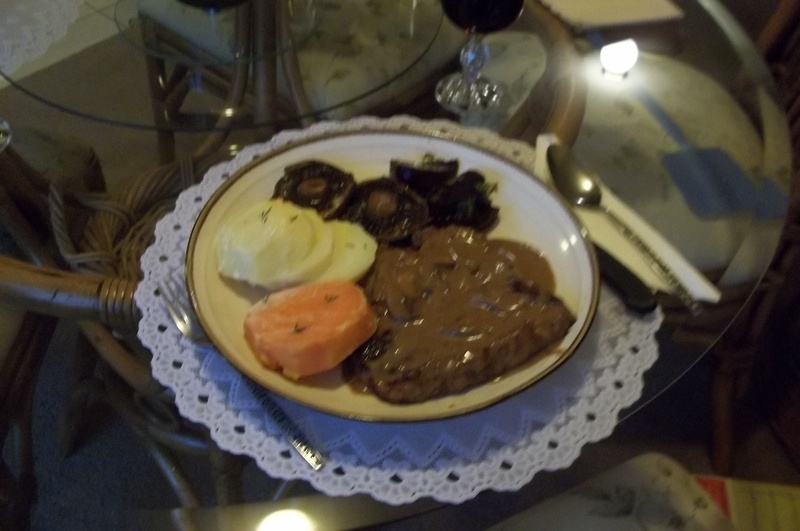 Every year I do special cooking for the family, but now the children are no longer with us, they live far away at their own home, so I cook only for the two of us. 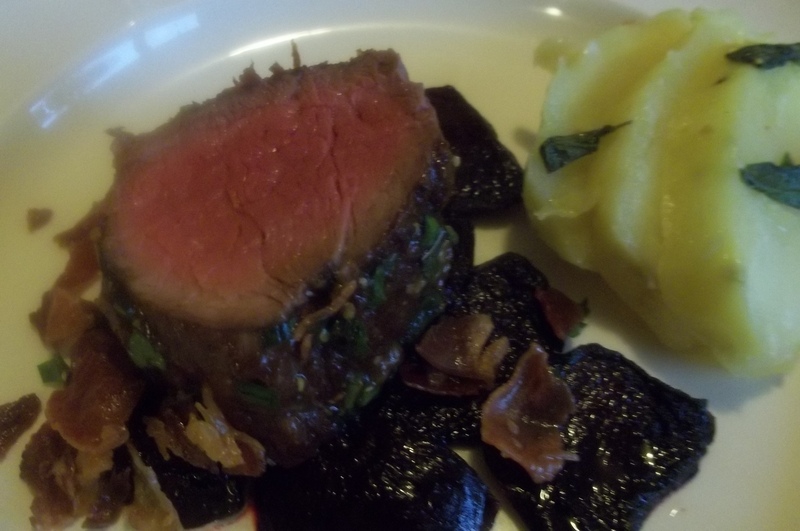 Fillet of Beef – Meat is one of the best product in Australia. 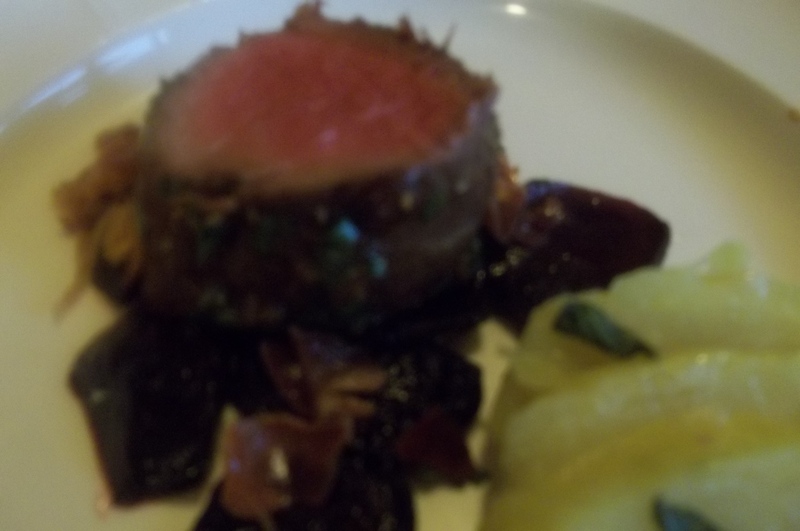 The fillet of beef were cook in perfection. 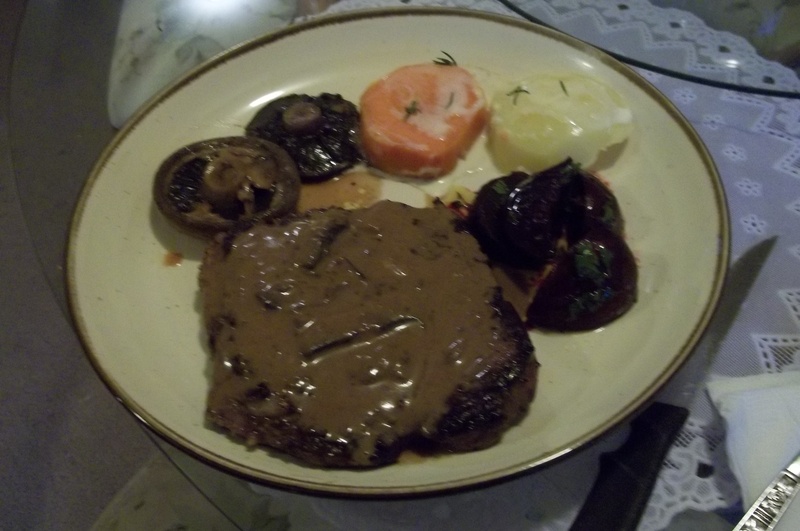 It was such a celebratory dinner indeed. 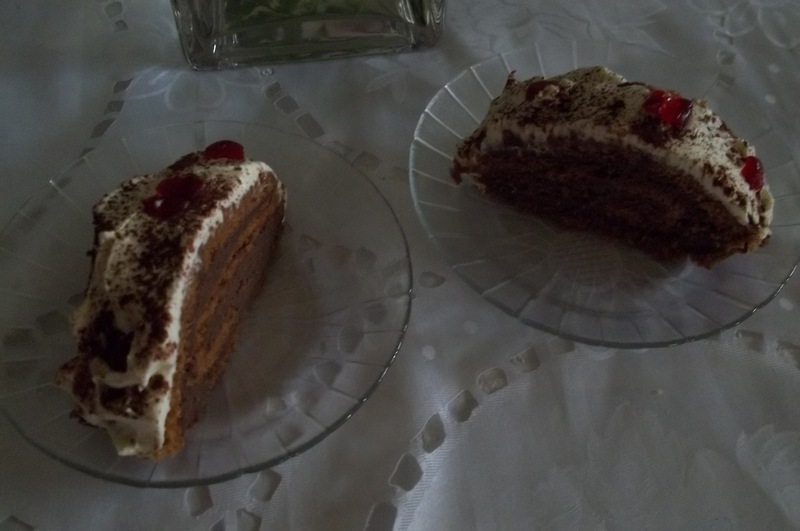 It was Easter celebration and also this month is very significant for me, as it was the time my dear grandfather’s passing. 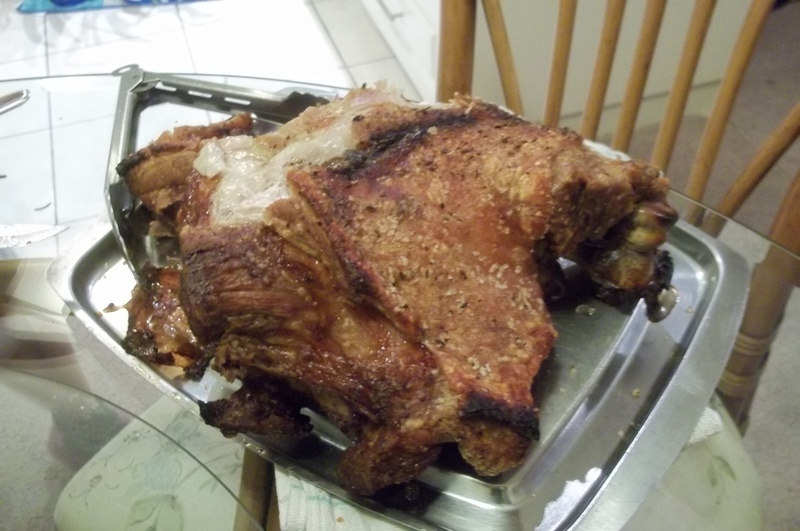 We grandchildren loved him so much, to thanks his loved I cook for the family every year. 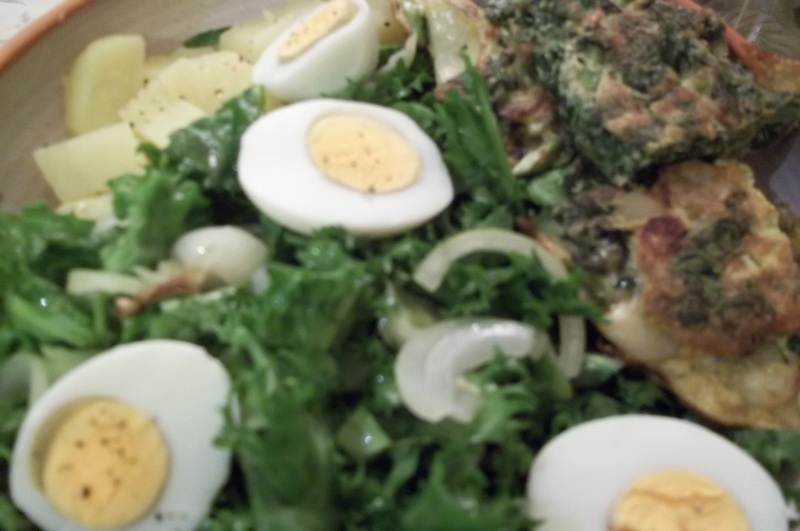 For this year, meat, Egg and vegetables were the theme of the dish. Thank you for your love Grand father-embah Kakung. 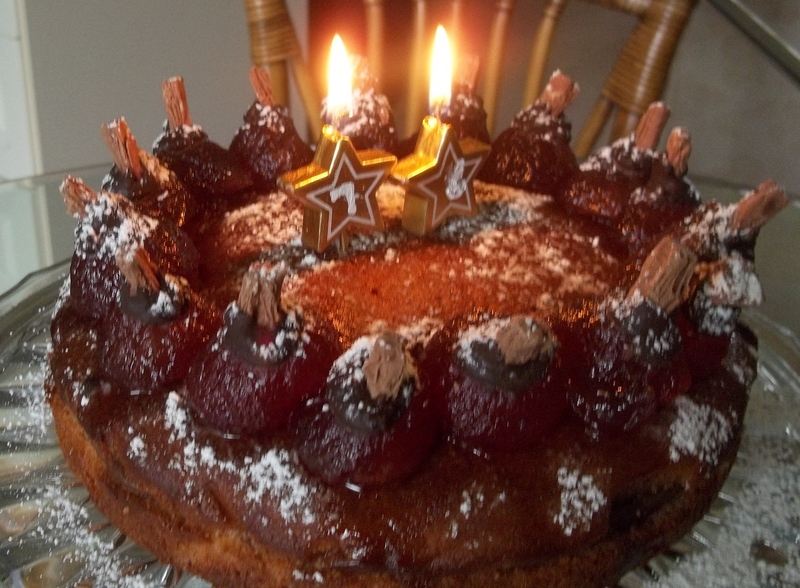 This month is a very important month for the year, as we have seven birthdays in our family. 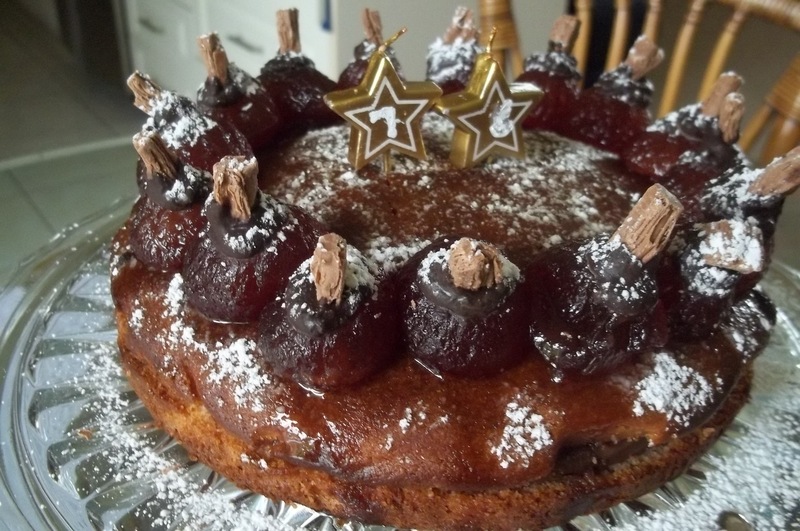 Rayner had a beautiful birthday cake, Pear Crown Cake and it was so good and it was so appropriate for him. 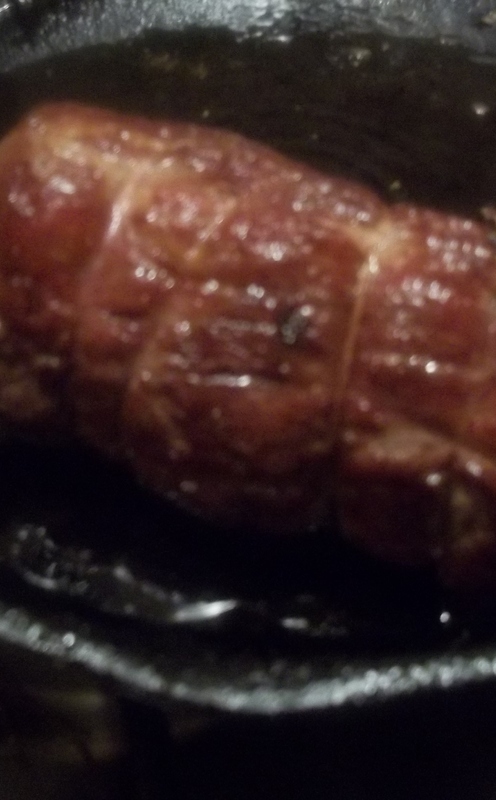 Pork with crackling is his favourite and it was cooked perfectly. This month was a busy month, we were holidaying in Europe. 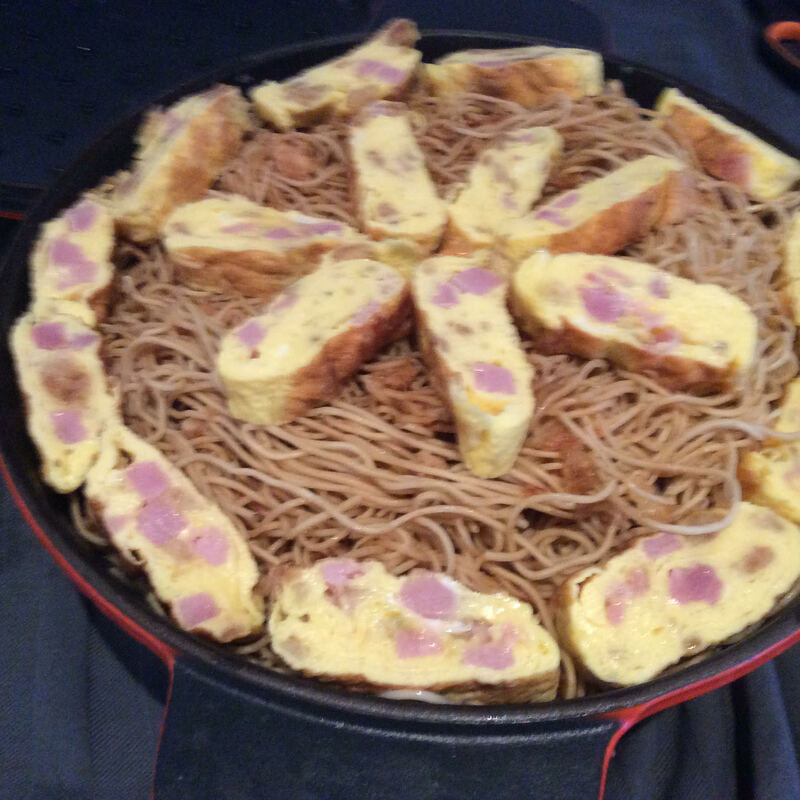 While I was visiting my daughter in the Netherlands, we had a big celebration for our grandson Milo, he was almost three years, but the feast was mostly dedicated for adults, however he loved the ‘bakmi’, one of the delicious dishes, he said that I was the cook and he loved it, it’s so delicious. 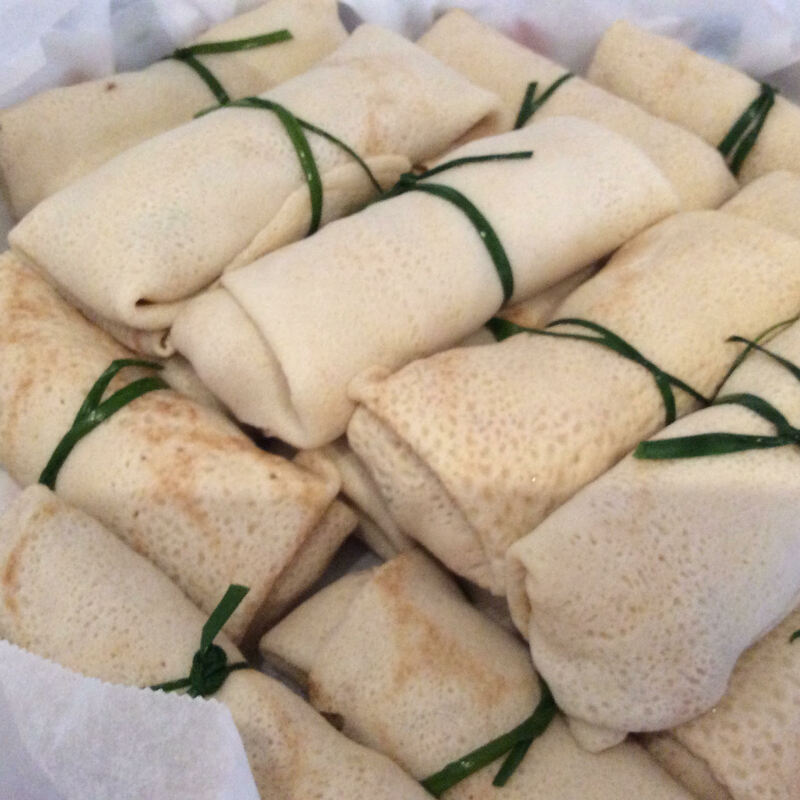 Lompia: pancakes rolled filled with mixed meat and vegetables. 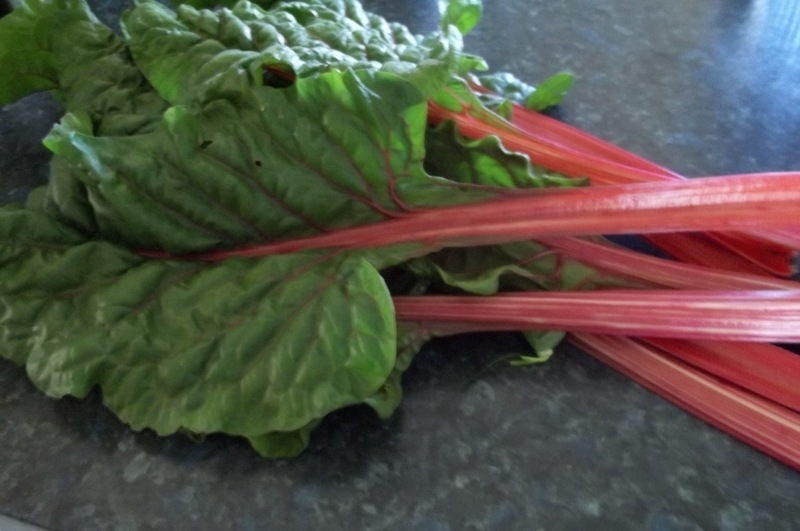 I am so pleased and proud if I could cook from my harvest of my garden. 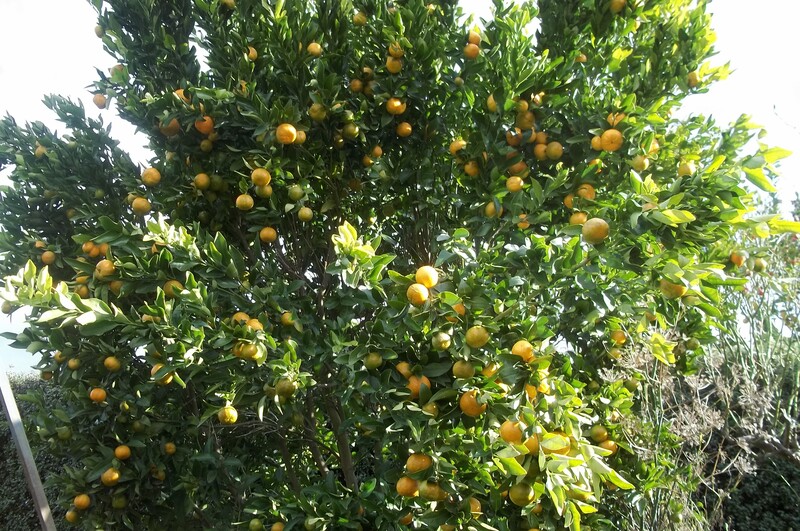 The vegetable patch is only small but the herbs grow well there, the olive tree gives me enough olives to preserve and so do the citruses. 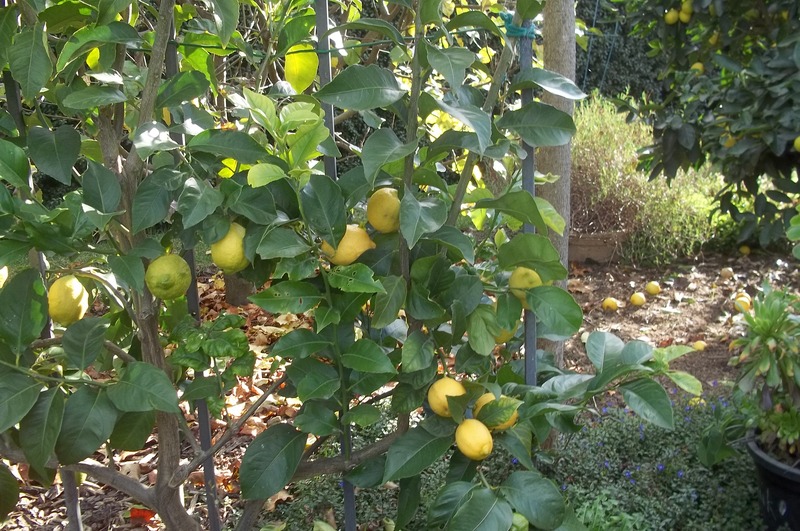 I preserve the lemons, make the preserve rinds in syrup etc. 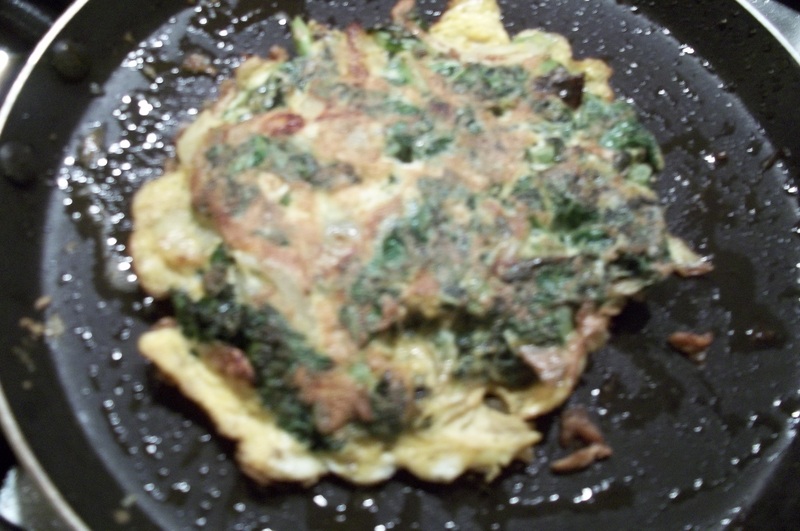 Cooking for family and friends is my offering, my greatest love that I could give, it is cooking for the gods. 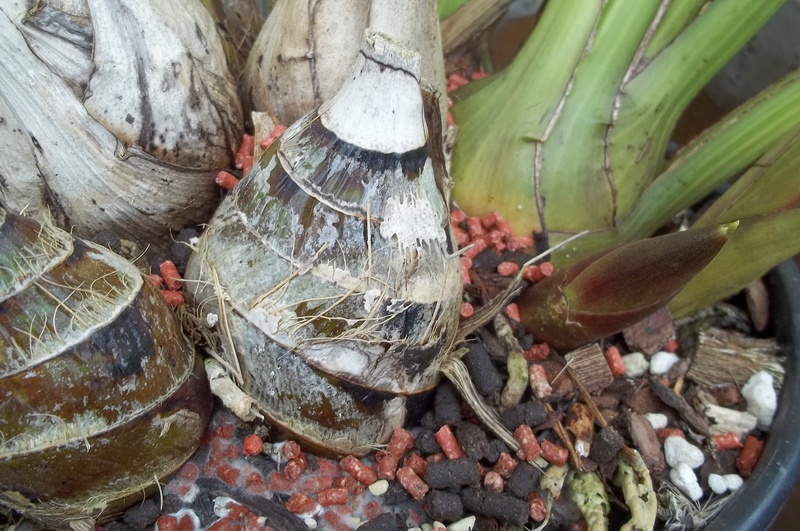 This winter is very cold and we had a heavy frost, some plants have damaged by it. 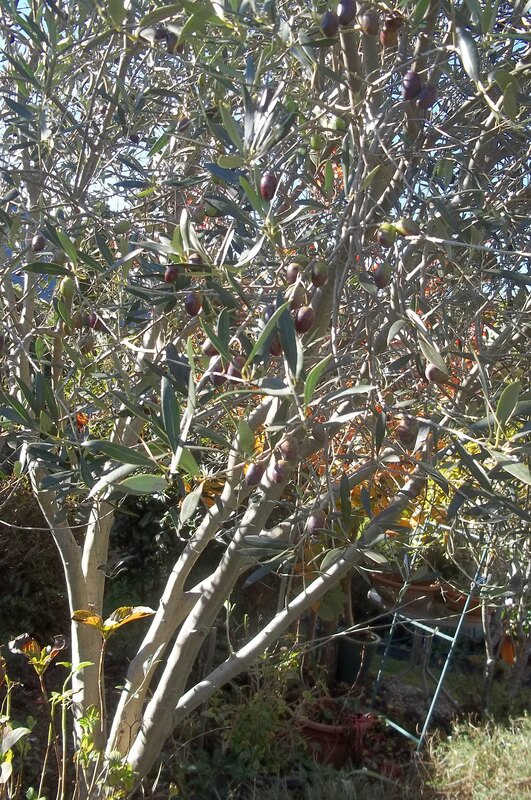 The olive tree were good and strong and had a lot of fruits, but the frost got it. 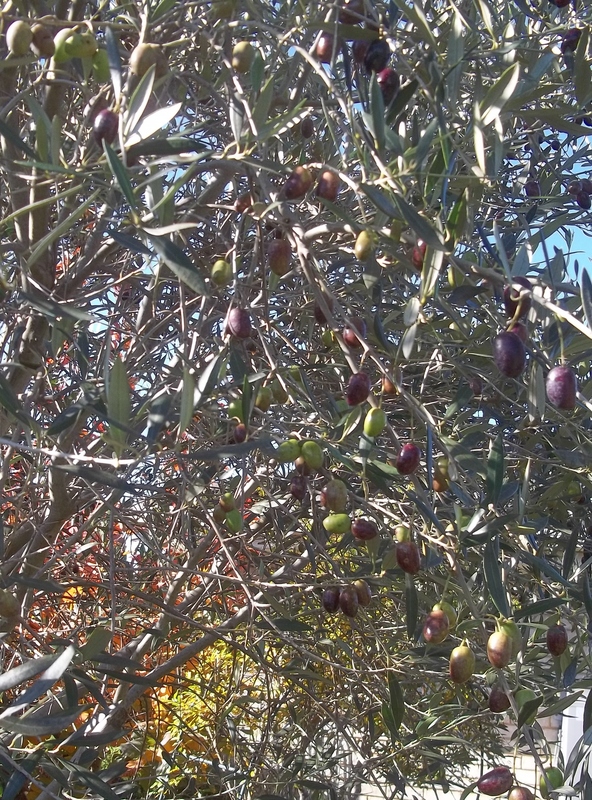 Last week I was so surprised and shocked that there were no more olives on the tree. 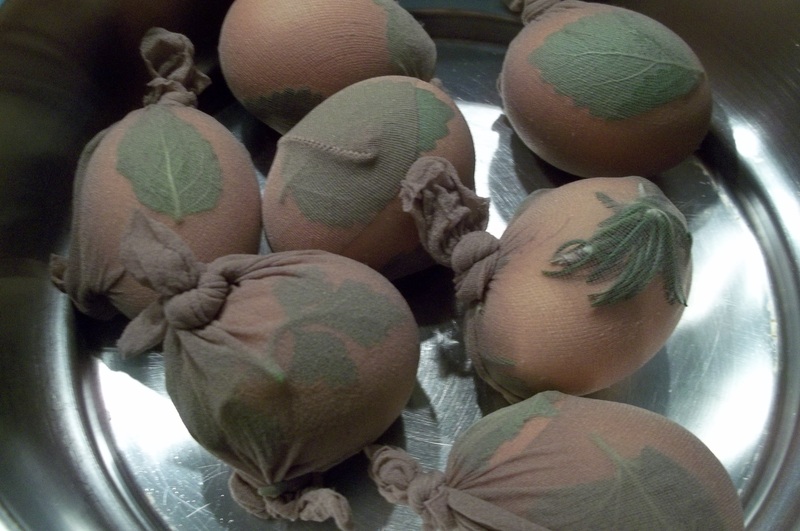 This was my first experience that the olives were simply vanished because of the frost. 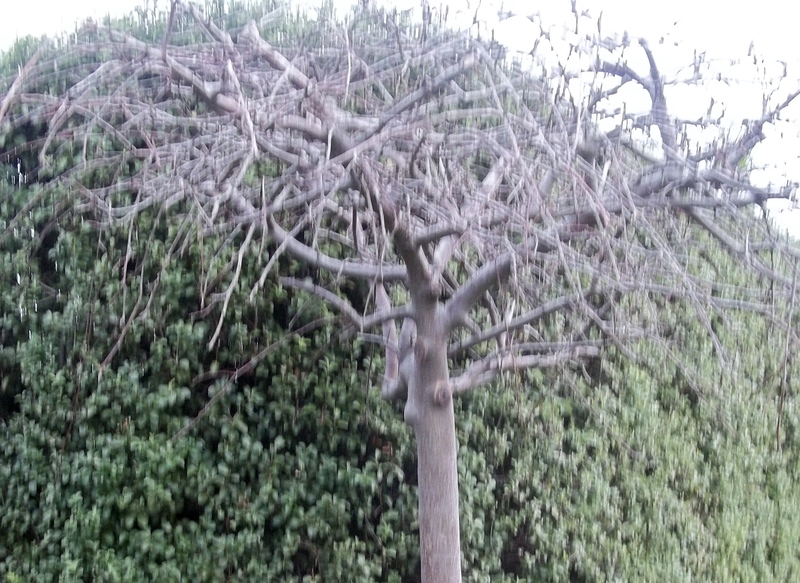 Anyway Rayner decided to chopped the olive tree to make easier to care for. 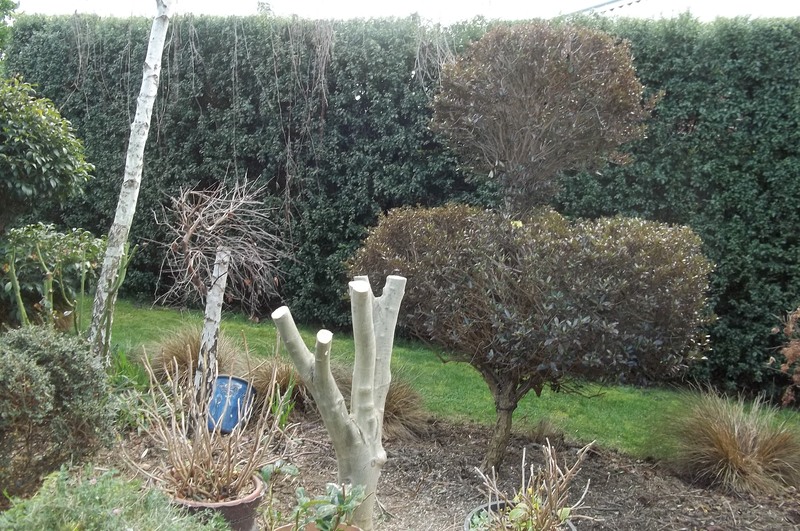 Now the big tree is not here any longer, instead only the stump, I do hope it will come back to live in spring. 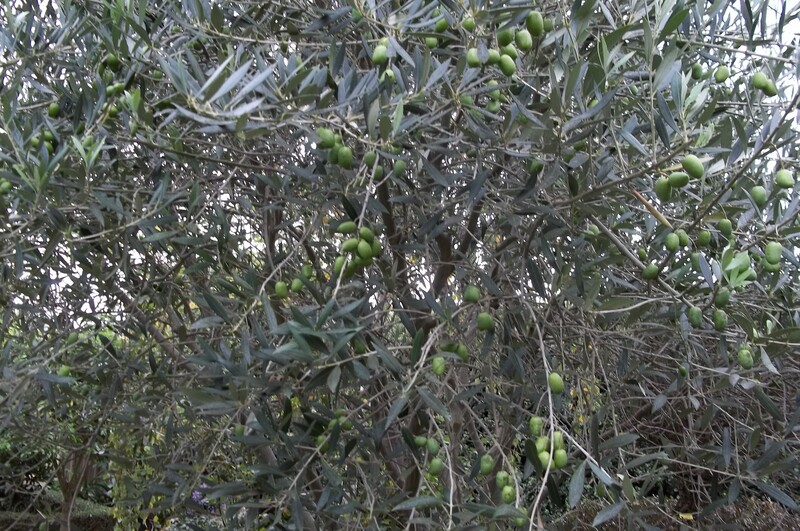 The picture of the olive tree was taken in 18 of May 2015, they olives were ready to harvest, unfortunately I did not have time, as we ought to go overseas the next day. The stump of the Olive Tree. 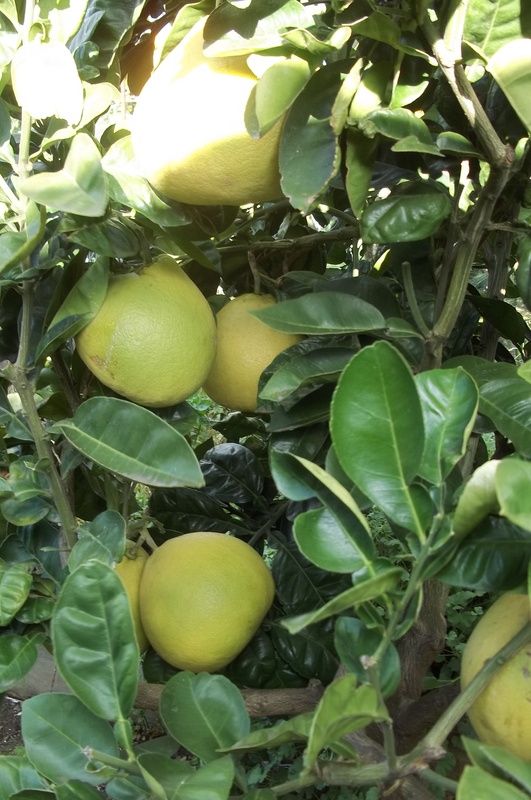 The garden looks subdued, well after all it is winter, the only plants that brighten up the place are the citrus trees, mandarin, lemon and pomelo. The look of the roses and the deciduous trees during winter. The garden is pretty clean now most plants are resting, we are looking forward for spring. 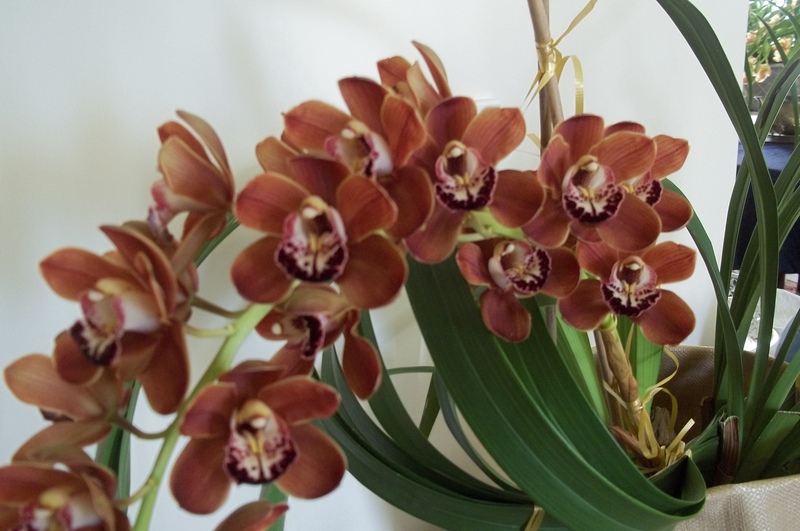 But the orchids are very good, in fact this year is the year for orchid to me, my cymbidium are flowering beautifully. 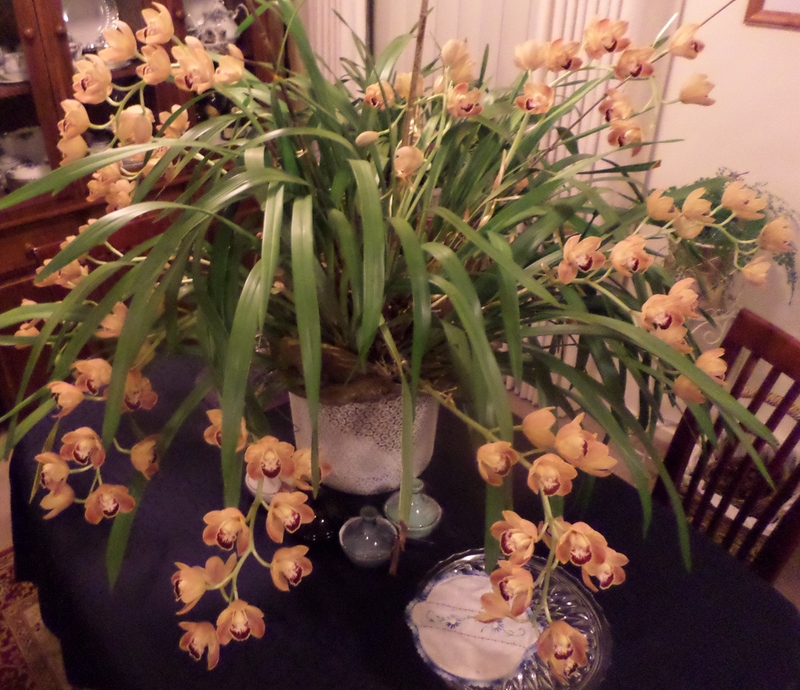 I must show you all about these flowering orchids in the next post. There is no recipe for you in this post. The sun comes up today, it’s a sunny day and I have been enjoying our backyard. 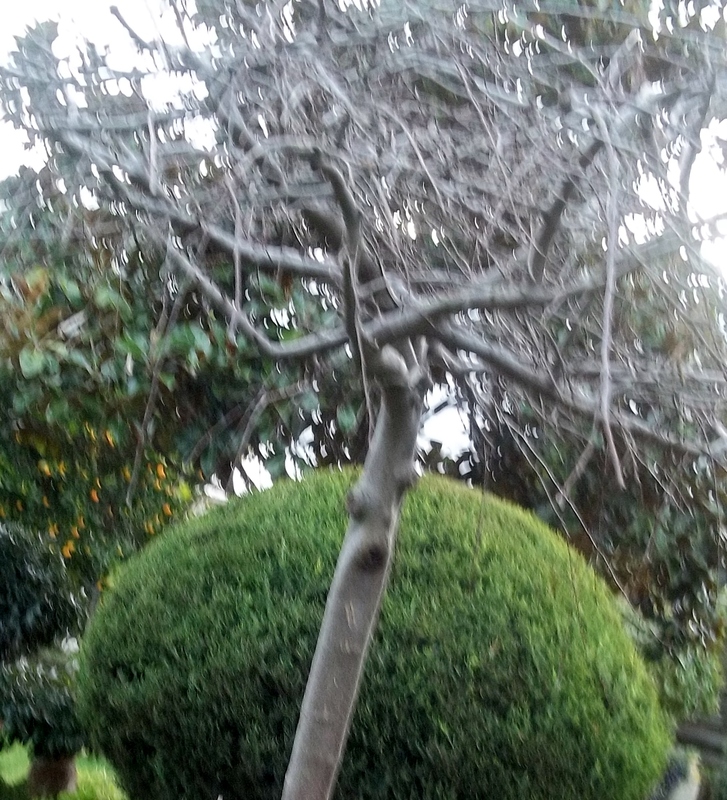 The common fig trees is losing the leaves but there are three fruits which are hung on to the branches. 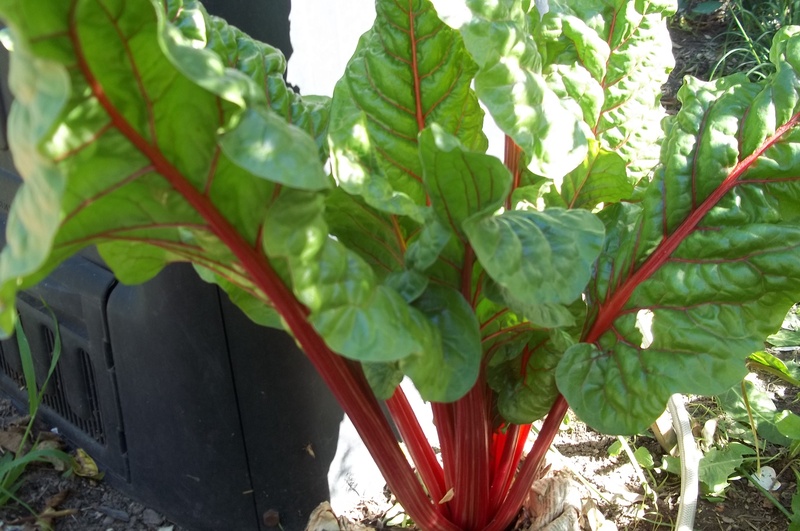 Swiss chard are growing so well, they are such beautiful vegetables, not only in colour but they very valuable for our health, they contains a lot of iron and potassium. 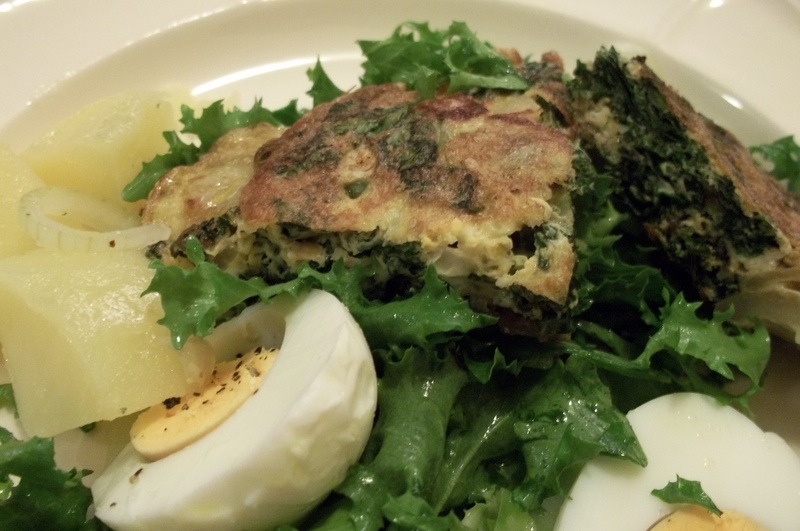 Vegetable scroll pie is on the menu today which celebrate the fresh Swiss chard. 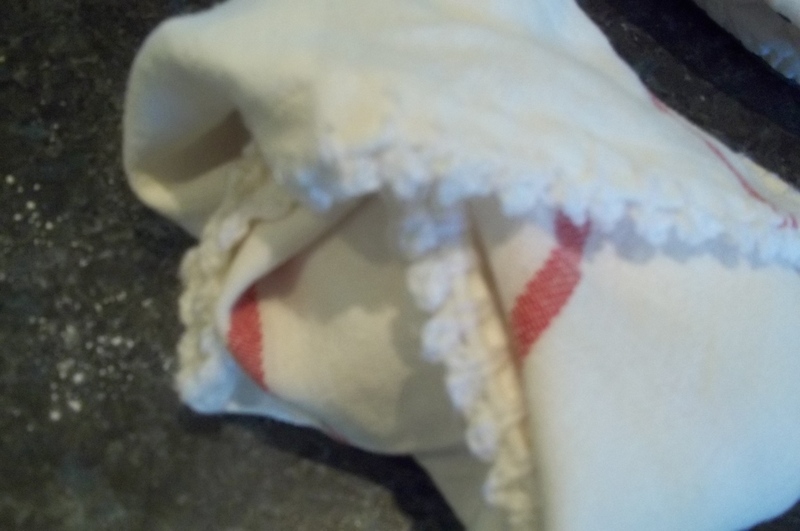 To cook and bake the pie, simply using water pastry or you can use bought Philo pastry. 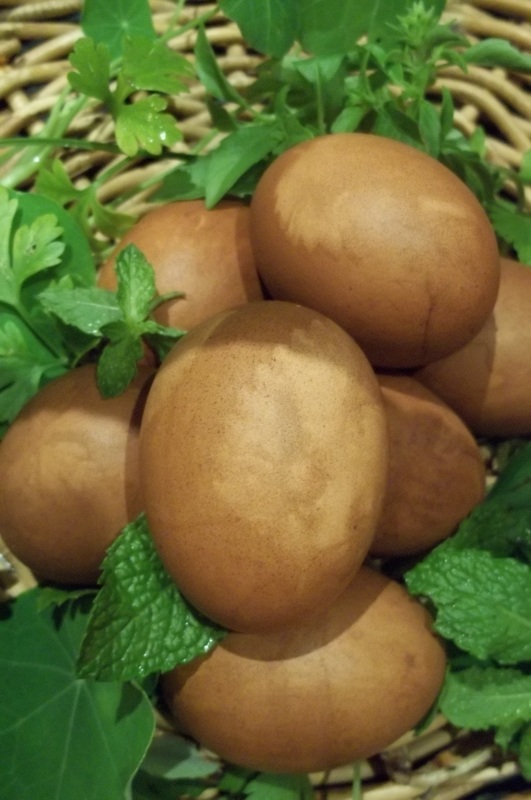 Water pastry with egg, it is richer and the pastry makes a soft and crispy crust. 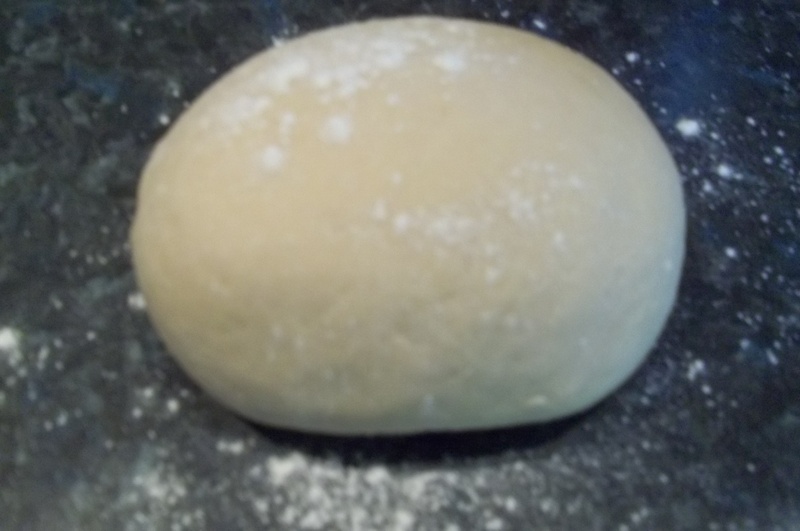 First mix the ingredients together, knead it for ten minutes to make a soft and smooth dough, Place and wrap in a cloth for 25 minutes before kneading to make thin sheets pastry. From the backyard to Kitchen. 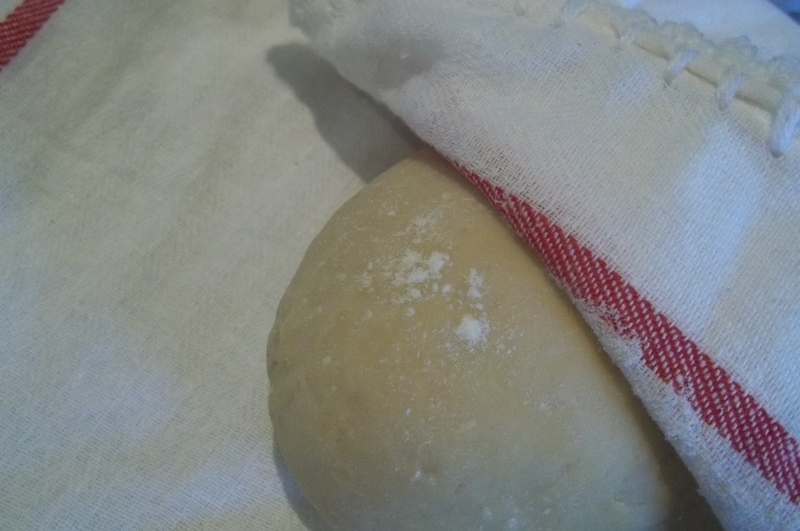 Make long thin sheets pastry about 25 cm length and 18 cm width, butter in between two sheets. 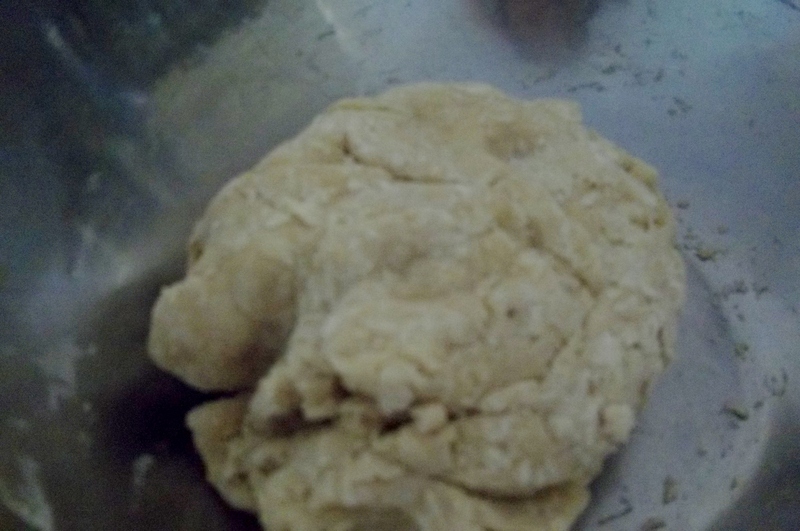 Take the buttered sheets pastry, put and spread two tablespoons filling on it, and close to roll the filling. 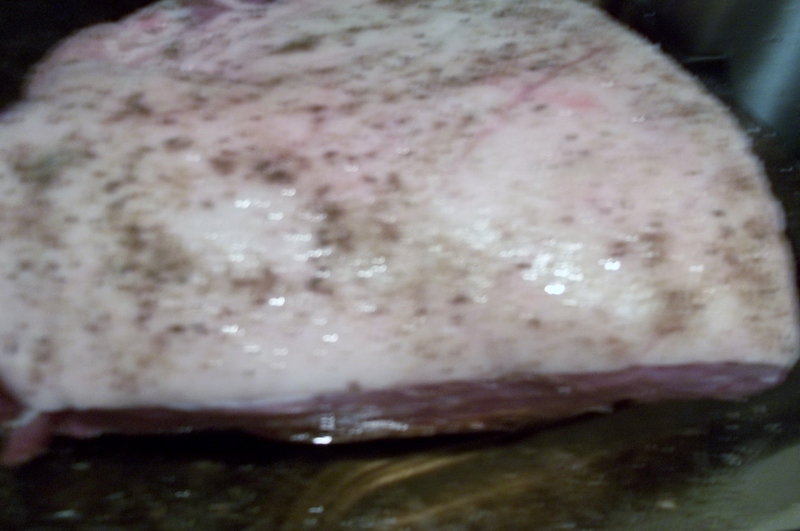 Bake in a hot oven for 22 minutes, you can brush the top with extra melted butter. 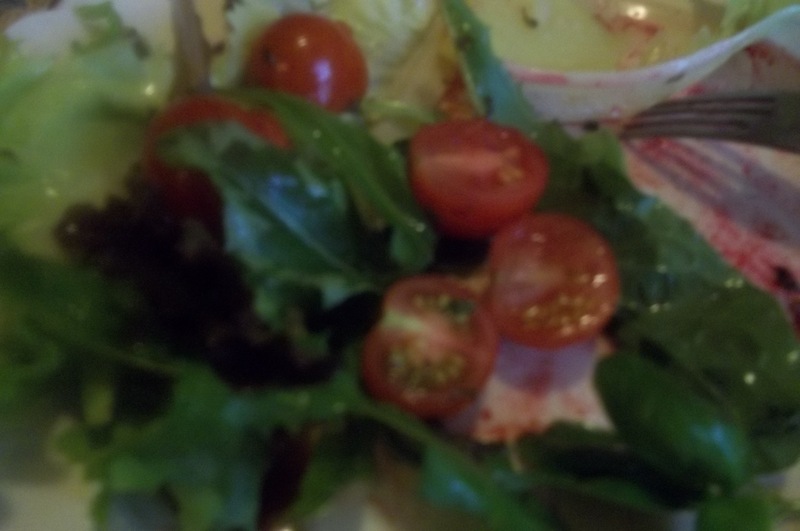 Serve hot with side salad. 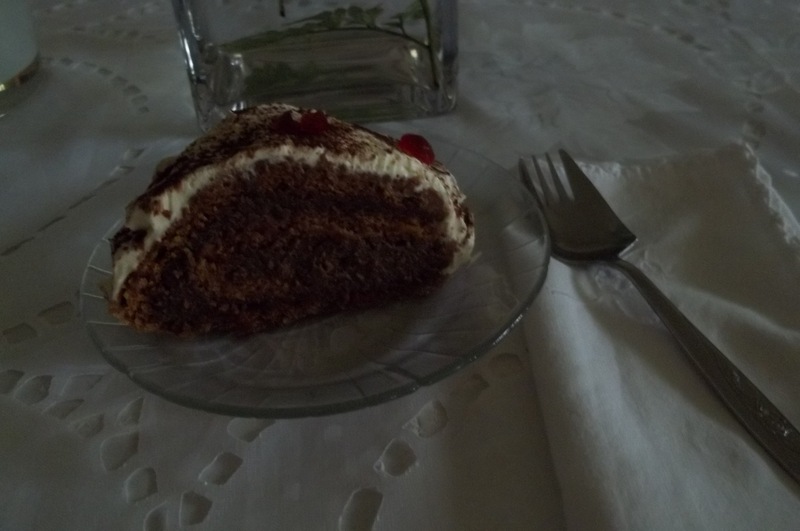 It is delicious to serve cold. The pie is good for pick nick. 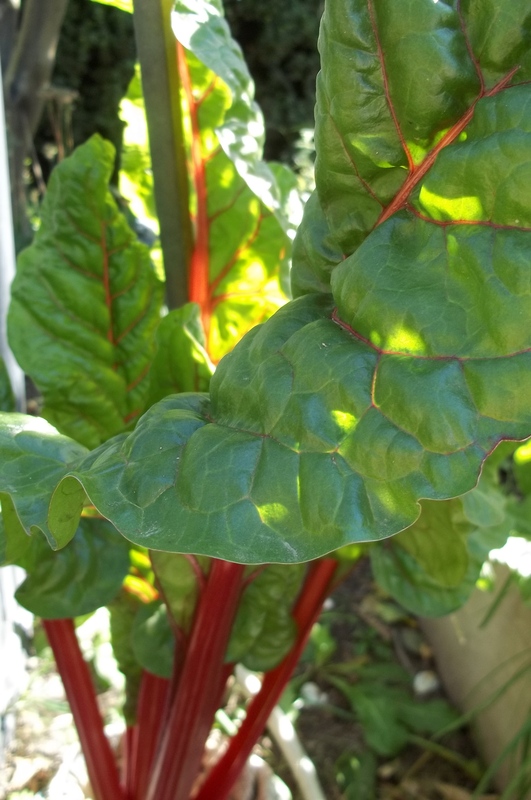 The Swiss chard plants will be here to stay through out winter, in any case the leaves will grow broader and the steam will be thicker too. 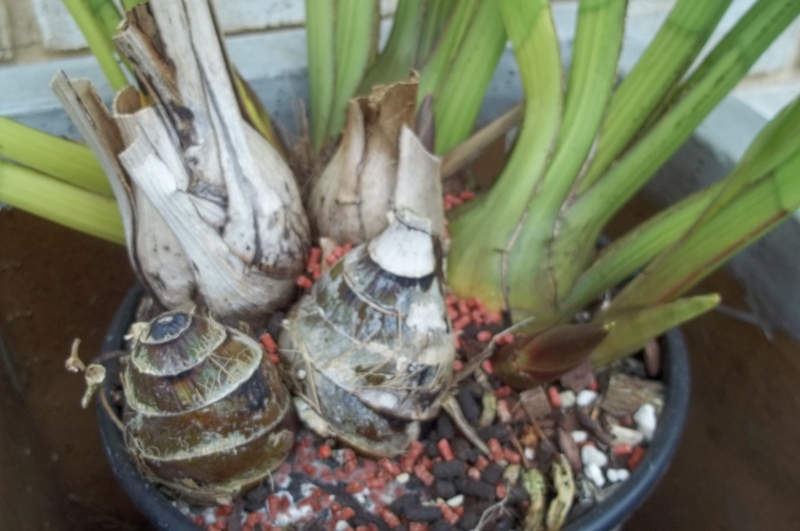 They do grow better in the cold weather. 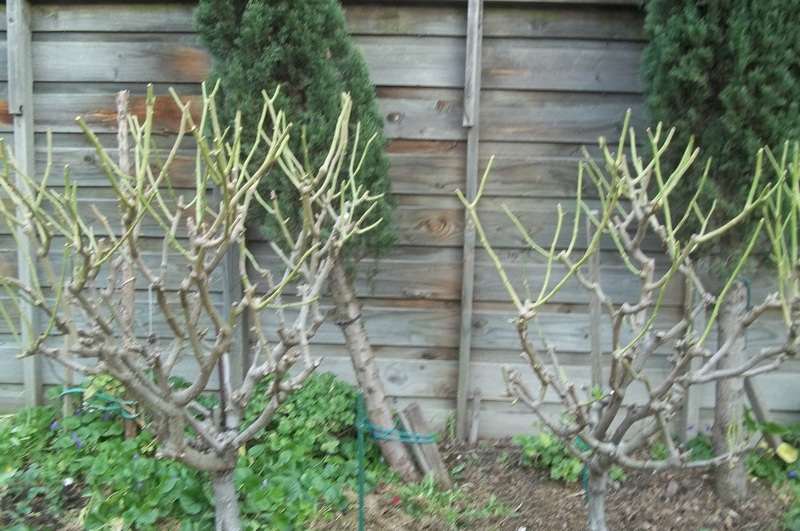 This month is mid April, and Rayner has already harvest the apples, there are not a lot but enough for us. 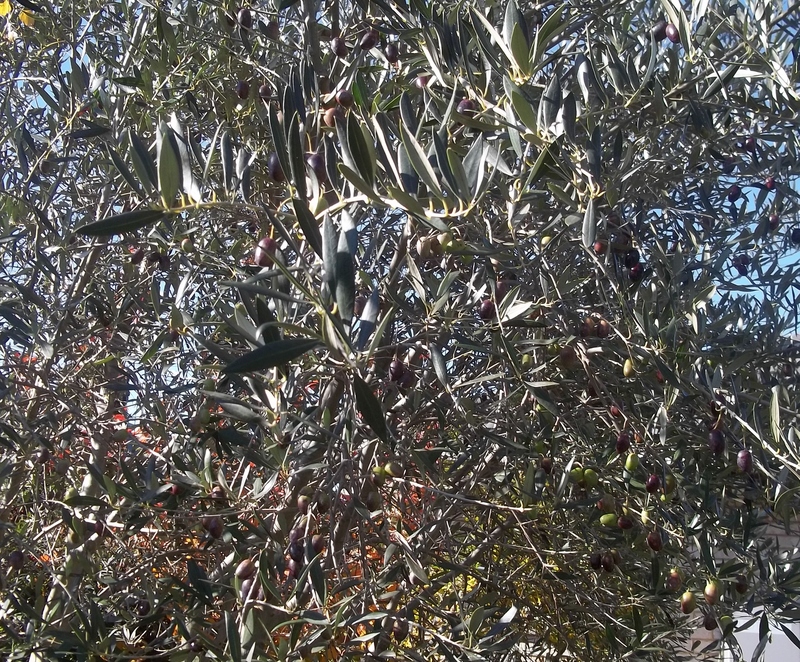 His olive tree has a lot of olives this year. 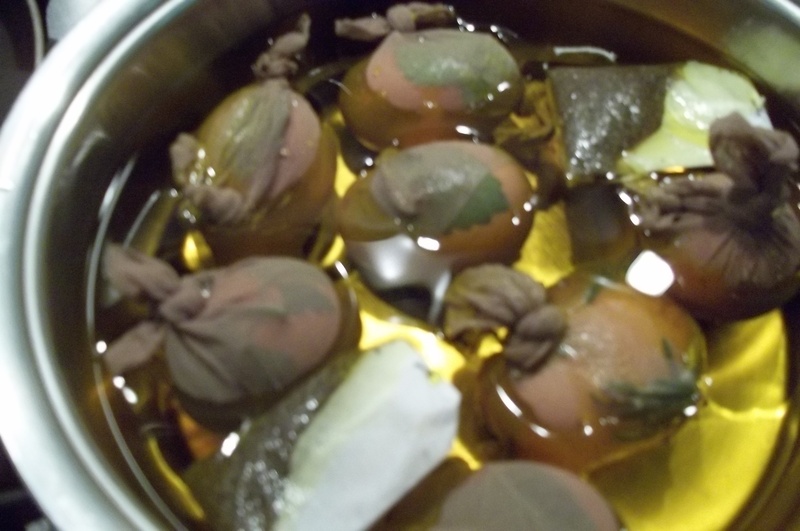 It will be busy preserving when it is ready to harvest. 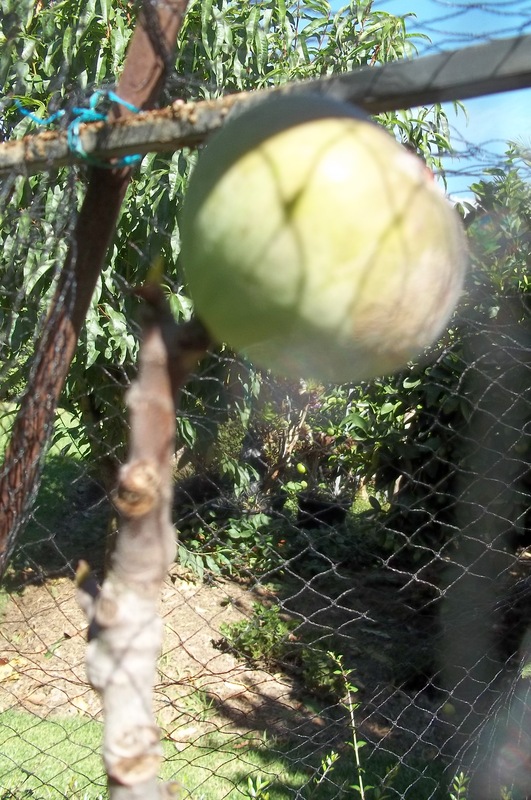 It is all good to have vegetable patch, fruit trees in the backyard. 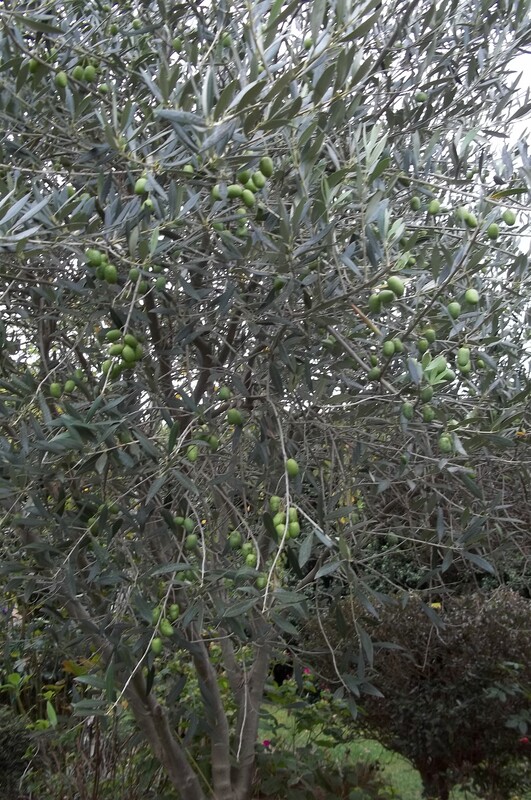 Harvesting is the best as we could enjoy the fruits, to eat fresh or to cook them, to preserve the olives and to enjoy them when they are ready. I was not born a farmer, now in my later life I am learning to be a gardener, and am pleased to say that I am not do badly. 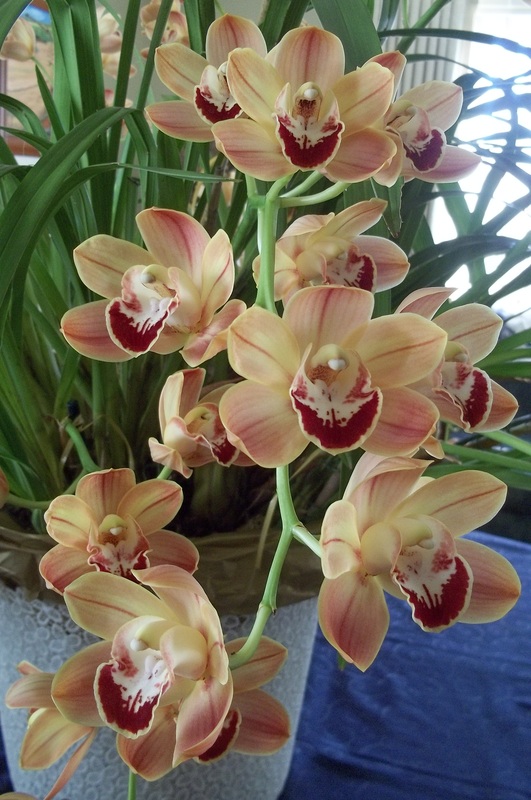 My cymbidium orchids are dressed, fertilised, they sit under the eaves, which protect the plants from the cold and frost, and also they are at the right position that the orchids gets morning sun daily. 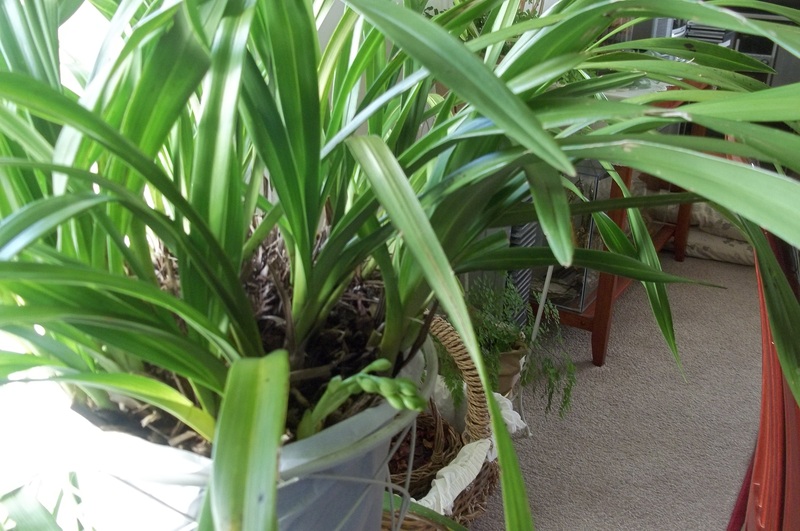 It was a lot of work to care for them, forty orchids needed all attention. 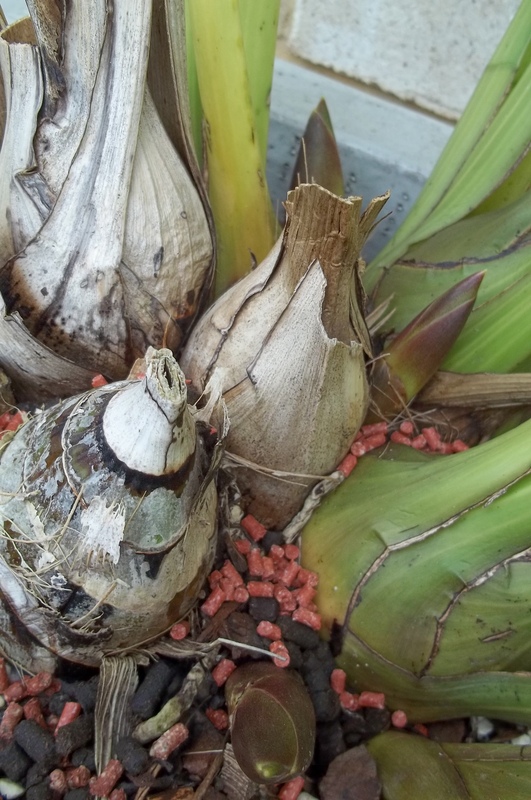 The good news is that some of them have spikes, there fore the slug bites have to be added on the pots. The big job is done, what we do now to water them but not over water at this stage. I think I will enjoy the flowers in a few months, may be in August. In good days, I spend a lot of time in our backyard, from gardening, maintaining, improving up to appreciating the harvest and the garden. Now is winter. 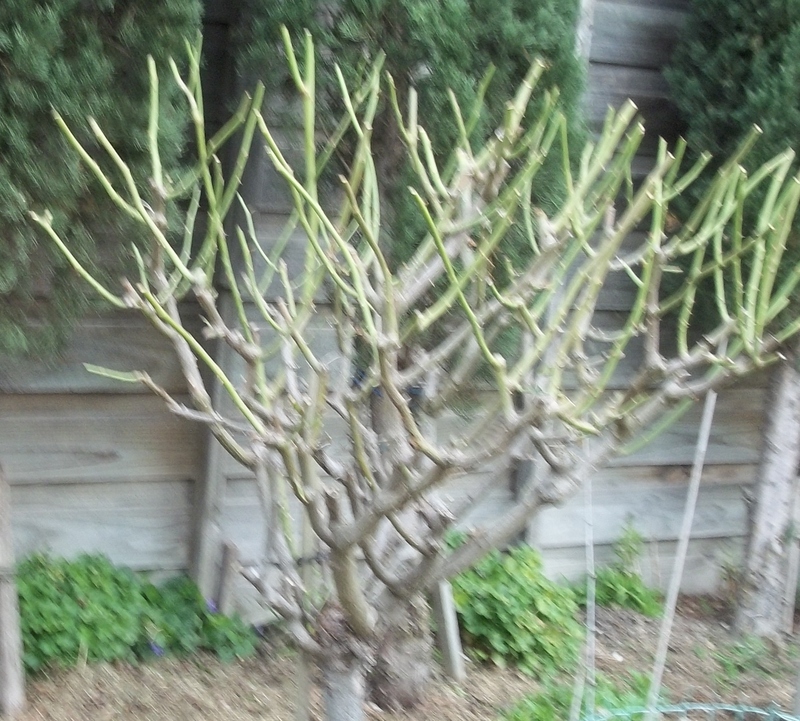 I am planning to re pot my English box topiary plants which I created over twelve years ago. Hopefully they are happier with the new pots. They will be moved from the backyard to the front garden, and sitting under the porch.